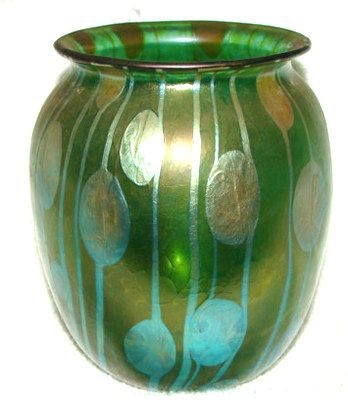 During the Art Nouveau period Loetz glass was the premier manufacturer of Bohemia art glass. Founded in 1840 by Johann Loetz, the company become known for its beautiful, organic forms and bold confident use of colour. Loetz glass pulled in elements from nature which can be seen with the frequent use of flowers, vines and leaf decals applied to its decorative pieces. Loetz made waves with their surface treatments and techniques, and when the fashion for floral pieces moved on, he pursued this even further which you can see in his collections, including Phänomen, and Streifen und Flecken. ‘Phänomen’ combined techniques used by Tiffany which created featherlike patterns on to the objects surface,they achieved this by using a molten hot base and wrapping equally hot glass threads around which were then dragged along the surface making wave likes patterns. Artisans also made other patterns while the glass was still workable. Streifen und Flecken (Stripes and spots) was another one of the most recognised styles from this inspirational glass house. Oil was dropped onto the base colour which created patterns in the glass. The way the designers allowed for the oil to fall naturally to influence every design is why Loetz pieces are so widely loved. Decorative bowls, cups, vases, and pitchers were other popular forms in the Loetz lexicon, and many of the pieces practically glowed thanks to their iridescent sheen from the firing and reduction techniques that were popular at the time. Not all of the documents for the glass house survived and research continues in the identification of the decors (designs). If you have any enquiries about the pieces we have on the website, don’t hesitate to get in touch and we will be happy to help.